Classic Army is a leading manufacturer of Airsoft products, setting standards for the entire industry. 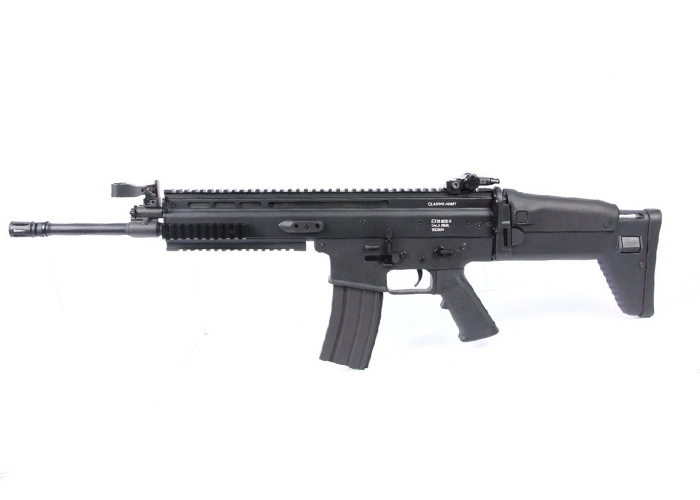 This model of the MK16 L AEG will ship directly from the manufacturing center. Additionally, MK16 L AEG is priced lower since the product is coming from Hong Kong! This is literally one of the best deals on Earth considering the package can ship to any country where its legal. It's time to get your hands on this affordable deal coming straight out of the factory! The CA MK16 is modeled after the new MK16 assault rifle that is in use with American special operations personnel in USSOCOM. This revolutionary design incorporates a side folding retractable stock making this gun adjustable for almost any circumstance. Also, the MK16 features a rail that runs the entire length of the reciever and the barrel that allow for the attachment of scopes and other accessories. If you do decide to mount a scope or red dot the iron sights flip down out of the way. All these features make this gun a great deal, so get the latest design for yourself. The product will ship straight from the factory in Hong Kong. No warranty will be provided. However, spare parts are included for future maintenance. Please expect longer delivery time depending on the country the item is being shipped towards. The customer is responsible for any policies, duty, and taxes that may apply for having the airsoft rifle enter their country. I want to get this gun but need to know what type of connector it takes and what is the recommend battery + charger. What battery should I use? Since the gun does not come with a battery which one should I use.